Tool Blog News Makita’s new and improved rotary hammer. This is one of the things I really love about Makita; they are always looking for ways to improve their tools. “We did some research on our best-selling BHR240, and made it even better,” said Ethan Haughawout, Makita’s associate product manager – cordless products. So you might be wondering what makes this tool better then the previous model. Makita was able to make the new BHR202 smaller, and added the same vibration reduction technology to the BHR202, that is found in their high-torque impact wrench. This means a more comfortable tool for you, and the extra loss in vibration adds more life to your batteries. Lets get down to the features. The Makita built motor delivers 1-1,000 RPM and 0-4,000 BPM. It has a 3-position switch to go from drilling, to hammering, to drill/hammering. A built in torque limiter clutch is designed to disengage if the bit happens to jam, and a 360° chuck with 40 different locking positions allows you to chisel at the position that is best for you. 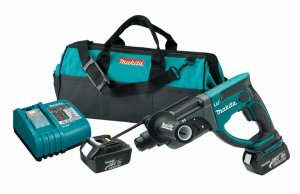 And of curse the BHR202 features, what is pretty much standard with all Makita tools, a built in LED light for more visibility, and Makita’s 18V Lithium-Ion battery technology. The BHR202 will be available September 15, 2008.